The UK has been the birthplace of many of the most legendary guitar amplifiers in the world. The velvety chime of the Vox, the golden purr of the Marshall and the chest crushing kerrang of the Hiwatt made history instantly along with the masters that wielded them. Toward the end of the sixties, guitar players started to embrace the wild characteristics of tube distortion and started working with it instead of against it. Around this time, Birmingham’s industrial backdrop was setting the scene for a whole new sound. In 1967, a young Birmingham bassist with an interest in electronics by the name of Lyndon Laney started building amplifiers in his parents’ shed. Now most people would never forgive themselves for quitting a band with members that went on to form the mighty Led Zeppelin, but Lyndon Laney etched his own name and sound in the history books with his amps that yielded a massive, dynamic low end and an endorsement from a fellow Brummie named Tony Iommi. Laney is perhaps best known for helping create the Heavy Metal genre by offering amplifiers with more gain on tap and a distinctive lower midrange growl that helped propel Black Sabbath’s iconic, elephantitus infected riffs into the stratosphere. This recent Lionheart range of amplifiers are a tribute to where that all began and the L5T manages to capture all the thump, growl and chime of a vintage British amp in a small, robust and beautiful 1×12 package. Each one is hand-built in Birmingham, with chassis-mounted tube sockets, gold-plated PCBs and premium components throughout. The white piping on blue tolex, stretched over marine grade plywood and topped with a classy leather handle, give this high-performance little amplifier all the visual appeal of a vintage British sports car and I simply could not wait to give it a test drive. It really is amazing how long it has taken for guitar players to understand that great tone comes from the preamp and poweramp stage of an amplifier both working hard. The L5T’s clean channel can go from sparkling clean to a corpulent crunch with complex, even-order harmonic overtones swimming on top of every chord. I have seldom played through an amplifier that responds to your touch as sensitively as this. Even without riding your guitar’s volume knob, the dynamics of your pick attack can dictate the level of breakup and volume between parts in a song, so you can worry about playing and singing rather than tap-dancing on pedals for different shades of gain. Brilliant!! Switch over to the drive channel and we are talking classic rock. From the warm and woody, searing leads of Kossoff and Blackmore, to the howling, harmonic feedback of Amboy Dukes-era Nugent. This is the tone of legends. Wind the drive all the way up and you are in vintage Sabbath territory that borderlines tonebenderish fuzz, without losing low end definition or mushing up. On the top end, there are no shrill or fizzy tones available no matter how you set the dials. Though this amp is billed as 5 watts RMS, after putting it through the paces with a hammer-fisted drummer and a bass player with a 1×15 and 2×10 stack, I can tell you I was at the perfect volume for gigging smaller un-miced venues and no drive or boost pedals were needed. It was so refreshing to have the power section cooking for a full frequency bloom of sound that responded to pick attack and volume control. With the L5T, Laney have destroyed the competition in the 5-15w range by not cutting any corners with offshore production, MDF cabinets or cheap, undersized speakers. The perfectly tuned cabinet houses a British-made Celestion Heritage G12H Greenback, over sized output transformers and you even have an effects loop. 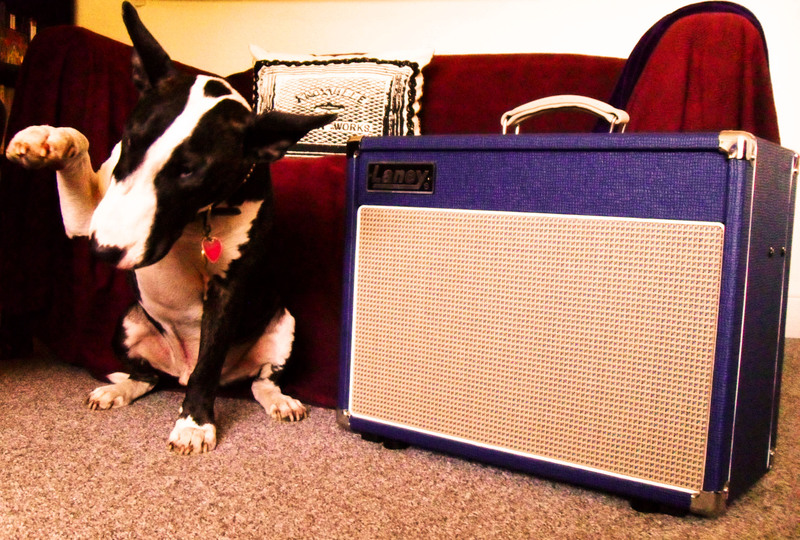 If you are looking for an amp that sounds great at home or in the studio, but has enough volume on tap for rehearsal and gigs, seek out the Lionheart and remember…you don’t vote for kings. Very good little-big amp. I ordered one. Just bought one and it lives up to the review, sounds great.